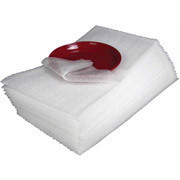 Protect Plates, Dishes & Fragile Items With Cushion Foam Sheets. Cushion Foam is made of 25' long x 12" Wide x 3/32" thick cushioning (perforated every 12 inches and can help protect your fragile items. These foam sheets are spongy / pilable and an inexpensive way to wrap and provide additional protection for your fragile items like plates and dishes.